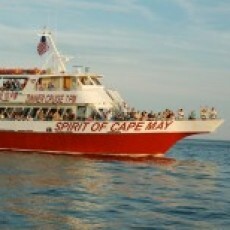 Founded in 2007, the Spirit of Cape May is the largest private charter and dinner cruise vessel in Southern New Jersey. The Spirit of Cape May is 110 feet in length, 28 feet in width and has two very large decks with seating for over 400 passengers. The main cabin is air conditioned and heated with seating for over 100. Additional dining areas can be arranged on the aft deck and upper deck. The upper deck boasts a large open air dance floor. The main bar is located on the lower deck and a secondary bar is setup on the upper deck. The vessel is all new from top to bottom, after having undergone a $3 million refit in 2009.